Fifty billion people live on the densely urban planet of Glisal II, the capital of the Celestine Ascendancy. Massive cities sprawl across most of the planet's continents and pollution clouds the atmosphere. Towering skyscrapers, the homes of the social and political elite, soar high above smog-choked urban valleys. Crime, as well as both power and economic inequality run rampant, with the top 0.1% of the population having more of both than the rest of the planet combined. The planet itself is of Earth-standard gravity and boasts a ring system around it, which visibly takes up half the sky, even during the day. Two platinum-rich moons also orbit the planet, which are a major source of wealth for the Ascendancy. Racially, the dominant races on Glisal II are the W'hoorn, the Nath-el, the Shen, and the Tukkav, with, as on most cosmopolitan worlds, smatterings of most of the other races of Starmourn Sector. The Celestine Ascendancy was formed in 35 A.E. as a reaction to the combined power of the Song Dominion in the aftermath of the Bushraki War. Glisal II was chosen as the capital because the Shen, the Nath-el, the Tukkav, and the W'hoorn - the founding races of the Celestines - all had large populations already living there in peace together. They sought to form an alliance that could resist potential aggression by the Song, for there have been various degrees of long-standing tension or outright hostility between some of the races of the Dominion and the Ascendancy. For instance, the W'hoorn/Ry'nari rivalry has been legendarily vicious throughout the millennia. The struggles between the Song and the Celestines over the last 900 years have resulted in multiple skirmishes and wars, including the terrible Empire Wars. 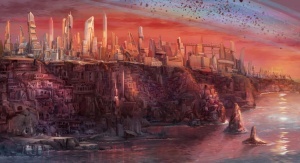 Litharge, the capital of Glisal II and the Ascendancy. This page was last modified on 17 October 2017, at 23:09.